Website content refers to the words on your pages. Aim for at least 500 words per page, ideally as many as 2000. But don't let writing your page contents worry you. You don't need to be a professional copy writer, nor do you need to write reams of text. We will edit and optimise your text (if you ask us to) to achieve the best results. It's what we do. When planning a website, we often tell people to think of it in the same way they would if they were designing a new house. However, when it comes to planning the website page content, the words and pictures that people want to see, it's probably better to have your favourite shop or supermarket in mind. Standing in the street outside a shop, the shop window tells what you can expect to find inside, and persuades you to enter. Your website home page and its content must perform the same task. It needs to be attractive, it needs to tell people what the shop contains and give them a reason to keep looking. Visitors take only a few seconds to decide if they like your website, and whether it contains what they are looking for. They read the headlines, skim-read the text that looks interesting and then either enter or look elsewhere. 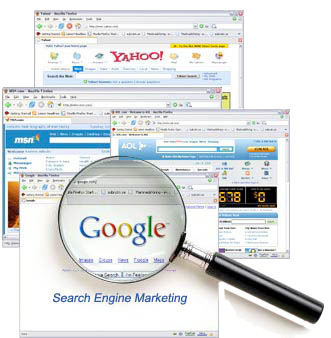 Google and other search engines have a huge say in how many people visit your website. Google doesn't care if your website is ugly or beautiful. Google is interested in website content. Their search robots read the titles and text content on your pages, and decide what your site is about and what information it contains. Then, when people perform searches, Google knows which sites contain the right information. As a target, your front page content should consist of at least 500 words, more if possible. The most important content and key words should be placed near the top of each page, and used frequently. When you step inside a supermarket, you don't want to waste hours trying to find things. You won't need to search the clothing section on order to find the orange juice or toothpaste. Everything is in a logical place, and well signposted. The things that are on special offer or which the shop wants you to buy are placed in full view of everybody, often in and around the entrance. Your website contents should be written with this concept in mind. Everything visible and in a logical place. Most websites have an 'about us' page and this should be used to talk about you and your business in general. You might include details of your experience, background or qualifications, things like that. Ask yourself what a potential visitor would like to know about you or your business, then answer the question. Remember that most people don't read everything on a website, so put the most important information near the top of the page. The best way to explain what you need to do is to give an example. 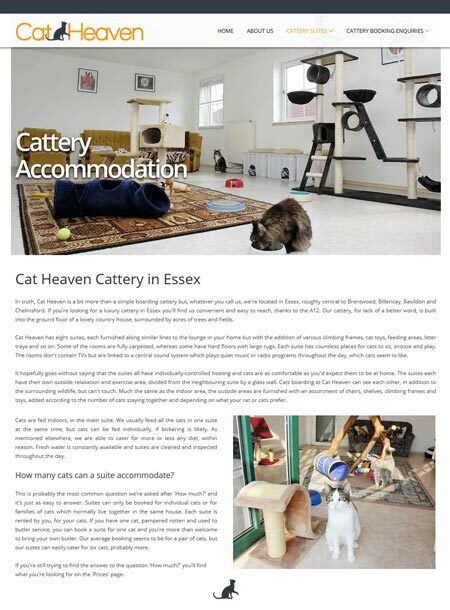 We design a lot of websites for kennels and catteries, so we'll use a typical boarding kennels and cattery to explain. Let's assume that you have a combined kennels and boarding cattery on the outskirts of Oxford. You've been in business for a few years and have decided that you need a website to help maintain or increase your bookings. Your main focus is to increase your visibility and to persuade people to come and visit your facilities, but you're also happy to receive online availability or reservation requests. In addition to your home page and an 'about us' page, you would want a page dedicated to your kennel facilities, with photos of the kennels, maybe some including previous guests. If you were booking a dog into a kennels, what questions would you ask about the kennels? You'd probably want to know what the accommodation was like, how big it is, if it is heated, what facilities are provided, if the dogs are exercised, where and how often. You might want to know if pets are insured, what food is provided and, if you have more than one dog, you might want to know if it was possible for multiple dogs to share a kennel. You might also want to know there is a local vet on call, and so on. So, write your description with these questions in mind, or similar questions as they relate to your business, whatever it is. When somebody in Oxford decides to search on Google for a kennels, they'll probably type something like 'kennels in Oxford' or 'Oxford boarding kennels'. They might also use different town names, like Kidlington or Littlemore, so if you're within easy reach of other towns and want to attract pet owners in those areas, be sure to add this to your descriptions. Keeping Google in mind, use your kennels page to describe your kennels, not other things. When Google searches your pages it will decide what each page focusses on and like pages that have a clear and precise purpose. By all means tell people that their dogs will be looked after by people who love animals, but don't make the mistake of filling pages with this sort of non-descriptive content. As a target, try to write at least 500 words. Having described your kennels, now do the same for your cattery, remembering to use the same principals - answer the questions your visitors will want to ask. Remember to use photos to support your text - if you have a cattery unit in a nice flower garden, add several good quality photos of this, and photos of the actual accommodation. As with the kennels page, stay on topic and don't fill the page with waffle unless you genuinely can't think of what else to say. You've described your cattery and kennels. Maybe you also want to add pages with extra information, such as additional services such as grooming, or terms and conditions. If you want people to come and visit your business, you would almost certainly want to include a 'how to find us' page with a map and some written instructions. Depending on whether you want to advertise your prices online, you might also have a prices page, and this will usually include combined prices for all your services, and maybe booking terms and conditions if you have them. 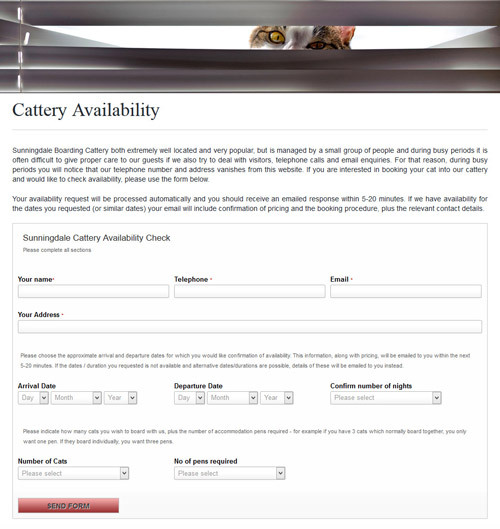 If you want visitors to be able to send you booking enquiries, you'll need a reservations form. You will almost certainly want a general enquiries form too, to allow people to ask general questions. Forms like these are easily constructed. Forms for bookings or reservations need more information and will have a variety of fields which visitors are required to complete, such as those asking for phone numbers, numbers of pets, booking dates and so on. All you need to do is tell us what information you want the form to collect. General enquiry forms usually include fields for a name, email address, phone number and then one for the actual message, to make it as easy for people to contact you as possible. We've noticed over the years that some clients are wary of receiving email from their website, fearing it will attract a lot of spam emails. It doesn't need to. Firstly, the email address that enquiries are sent to from contact forms are invisible. This stops robots which trawl websites looking for written email addresses. Secondly, the forms we use incorporate several features which stop a lot of the spam emails that are automatically generated. Finally, what we always suggest is that you use dedicated email addresses for forms, one that hasn't been used before, such as enquiryform@yourdomain.com. Then, when you receive an enquiry, you should reply to it from your normal email address, such as enquiries@yourdomain.com. That way, search robots will never see your hidden email address. This way, you will only get spam emails if a spammer visits your site in person and manually writes the email, which very, very few ever do. This example doesn't apply to you? Obviously, depending on your business, or why you want your website, the pages you want on your website will be diferent, but the basic idea is the same. First think about what pages you need and how they will connect, them write specific, distinct content for each page. Our designers will take your basic text and if necessary reformat it to ensure it is effective. If you're not sure what to say, our designers will help you with that too. However, the more information you provide us with when you start out, the better the result is likely to be! You've probably seen adverts or received junk email offering 'SEO'or 'SEM' advice and you might have wondered what it is. Well, SEO means Search Engine Optimisation, and SEM is Search Engine Marketing. They are both similar and essentially involve optimising the on-page content of websites so that they receive the highest ratings with search engines and then using various methods to promote them. If you plan to undertake paid-for advertising, a good SEO/SEM professional should be able to help you improve the effectiveness of your advertising. These days, any competent website designer will ensure that your website is optimised for search engines before it goes online, but if you create your own pages or make changes to the site after it goes online, an SEO professional may be able to help you make it more effective. However, if you have no plans to use paid-for advertising, the value of paying someone for SEO advice are less clear-cut. The stated objective of most SEO marketing is to put your website at the top, or in the top 3, of Google's search results, and so help you attract the maximum level of exposure and traffic. If you're thinking of offering a website offering holidays overseas, flight bookings or something with a nice big market, you'll need all the help you can possibly get if you hope to get on Google's front page. To do so you'll need to have a website that's better promoted than Virgin Holidays, Booking.com and a multitude of other multinational sites. And one hell of a big budget. On the other hand, if you're planning a website for a local business you may well find that you can achieve your goal of being top of Google's search results without paying a soul. If your website is properly written and optimised, and if you register yourself with relevant directories and services such as Google Local, you may well find that your website appears at the top of Google's search results naturally. Every week, millions of people receive spam emails offering SEO services which promise to "put your website on Google's front page" or something similar. Others receive emails selling 'SEO secrets' or hundreds of links. The best thing to do with these emails is delete them. The fact that these people advertise by using spam emails, often from anonymous gmail accounts, should tell you enough about the integrity and professionalism of these people. The current fashion is to offer hundreds or thousands of Facebook 'likes' or tweets, with the promise that this will drive visitors to your site. Our advice is to avoid these people like the plague. False 'likes' created with false Facebook profiles or spam-posting twitter accounts are nothing more than fakes.... it doesn't help your website to have a hundred fake people with a hundred fake 'friends' posting fake likes. Real people will never see them, or follow the links. In fact, Facebook are currently trying to rid themselves of this particular plague. More repuable companies will offer to write 'articles' which are posted on various blogs to create more links. How much of this is of use for the average small website is a matter of debate. We suggest you get online with a well-designed website which has been optimised properly, register yourself with the 'Google Local' service and then give Google a couple of months to evaluate your site. Later, once you know where you stand, you can start ploughing through the SEO maze if you want.